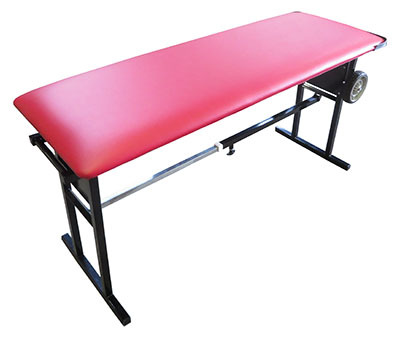 Portable Treatment Tables are designed to provide athletic training staff and medical professionals with the ability to practice quality treatments just about anywhere. The MATT® Portable Sideline Treatment Table is designed to provide athletic training staff and medical professionals with the ability to practice quality treatments just about anywhere. This treatment table is light in weight and can be set up in under 10 seconds. The black powder-coated frame is extremely durable and sturdy, making the MATT® perfect for both indoors and outdoors. The frame can open and close as well as lock in place with its spring-loaded plunger locks. The MATT® features 2-inch padding and 7-inch ball bearing wheels for easy mobility. It measures 23" W x 34" H x 66"L and has a weight capacity of 1000 pounds to hold even the largest athletes. Dimensions: 66" x 44" x 23"